Finally! And About Time, Too! How about we just change the spelling to hydroflourocarbons? Then everyone would know how to spell it and I wouldn’t have to keep correcting it. Another death on Caltrain today, apparently somebody hit by a train while walking on the tracks in San Mateo. There have been an unusually high number of deaths this year. But it doesn’t seem to me that Caltrain is operating any less safely than the year before. Are people getting more careless? Well, this evening, as my train was approaching, a young woman was talking on her cell phone while standing right at the edge of the platform, leaning wayyyy over the tracks and peering intently off into the distance as if trying to make out some faraway train. And facing in the wrong direction, of course, to see that in about 15 seconds she was going to get whacked in the back of the head by Lord knows how many tons of steel crawling into the station. Just oblivious, and apparently to engrossed in her conversation to hear the train approaching behind her. Another passenger noticed this before I did and started making frantic waving gestures to her; she figured it out and scurried out of the way with maybe five seconds to spare. Sheesh. Over Labor Day weekend and the following week, Dave and I drove to Arizona and Yosemite. It was my first time to Yosemite. I’m already back in the busy routine of work and don’t have much time for blogging, so I want to at least get just the outline down. I’ve also got a bunch of pictures to put up. We left Berkeley in the mid-afternoon with a rented SUV packed with our luggage, our camping equipment, and 13 boxes of books. Another 12 boxes had been shipped to my father’s house in a suburb of Phoenix. Our destination was DiscWorld in Tempe, Arizona, a science fiction convention focused on the books of Terry Pratchett. Dave’s bookstore, The Other Change of Hobbit, was going to have a table of books for sale. The drive south on Interstate 5 was smooth and uneventful, and we reached the Grapevine at twilight. Then east to San Bernardino, where we spent the night at a Motel 6. We drove east into Arizona and reached the hotel in Tempe where the convention would be around 2:00 pm. We unloaded the books and set up the tables in the dealers’ room. I had a bit of a headache, not bad but persistent, lasting much of the afternoon. In the evening we headed over to my father’s house, where we’d be staying. We bought takeout Chinese food and had dinner. Dave had arranged things so that he wouldn’t need to cover the tables on Saturday, so we were able to spend the day together seeing some of Phoenix. We took a hike in Papago Park, and visited the Arizona History Museum in the park. It was a free-admission day, but the museum was still a bit of a letdown — it looked rather as though a lot of money was spent to build the museum and then funding dried up to update and add to the exhibits. We were done in 90 minutes. Had we but known, we would have skipped the museum and spent the time instead in the Desert Botanical Garden on the north side of Papago Park. Dave was selling books at the convention on Sunday. I spent much of the day with my father, taking his dog Max for a walk in the morning and then to a local dog park in the afternoon. My father also showed me some of his old papers that he’s been going through. He’s a mechanical engineer who worked in aerospace for many years, and has a lot of interesting old stuff. It helps that I’m a technical editor working on (among other things) engineering books, so that I can sometimes halfway understand what I’m looking at. Spaghetti dinner at my brother and sister-in-law’s home. They’re both teachers (history and math respectively) and progressive Christians and always interesting to talk with. Dave and I got up early to spend an hour or so at the Desert Botanical Garden before the dealers’ room opened. The garden turned out to be quite large and very interesting, and we probably could have spent at least three or four hours there. Something to put on our list for another trip. Dinner at my brother’s again. We left in the morning, driving west back to San Bernardino, and then north along Interstate 395, coming up the east side of the Sierras. Once we got away from the cities, the drive was very pleasant. On a long drive I sometimes do a sort of “driving meditation”, keeping my focus on what’s happening around me right now, staying conscious of my breathing, especially when I notice my mind has wandered and I want to bring it back to the here and now. This was a very nice stretch of highway to do that on. We got to the campsite at Twin Lakes a little before twilight. Dave had reserved us a campsite about 30 steps from the edge of a beautiful lake. After spending a few minutes oohing and aahing, we set up the tent and drove back into the town of Mammoth Lakes for dinner. I got up a little before dawn (force of habit — my alarm clock has been going off at 6:15 each weekday morning for long enough that my internal alarm clock seems to be set to go off shortly before that). I had a touch of a headache, not bad but enough that I wasn’t going to be able to get to sleep, so I put on some clothes, grabbed my camera, and left the tent to walk off the headache and get some pictures of the dawn. As it happened, this headache turned out to be one of the ten-hour wonders I sometimes get. Hydrocodone lightened it but didn’t kill it completely, and made me queasy to boot. Fortunately the headaches I get now aren’t usually incapacitating like they used to be, but I was moving a bit slow till it went away. In late morning we packed up camp at headed for Yosemite. Along the way we took a couple of scenic detours, first to look at the other nearby lakes and later to stop for a couple of hours at Mono Lake. Then a stop in the town of Lee Vining for lunch. Got to Tuolomne Meadows in the early evening and set up camp. Morning was a hike to Lake Elizabeth. Just beautiful, very tranquil, both the lake and the hike to get there — the hike was a high point of the trip for me. In the afternoon we took a side trip to the old mining town — and now ghost town — of Bodie. It’s an amazing piece of preserved history. I’ve already blogged about the faro table in the previous entry. Dinner was a simple salad made from lettuce, tomatoes, and fruit purchased in the general store nearby. We got up and ate breakfast, then packed up the tent and equipment and drove out of the campground. We parked a little way down the main road and took a hike through Tuolumne Meadows. Then we stopped by the general store to pick up something to eat later for lunch. They weren’t making sandwiches yet — too early in the morning still — so we bought a loaf of bread, some sliced turkey, and a ripe avocado to make our own with. We drove west and had lunch at a picnic table on the shore of Lake Tenaya, sandwiches and leftover salad. As we ate, several Stellar’s jays showed up and watched over us, clearly waiting for us to finish so they could look for dropped crumbs. Then we got back in the car and headed west out of the park and back to the Bay Area. As we drove, we passed an astonishing number of cars coming the other way, so I’m glad we went during the week and not on the weekend. Thursday before last, Dave and I visited Bodie, an old mining town turned ghost town in the eastern Sierras. It’s a fascinating place, and I also accomplished a small personal goal there, which will take some explaining. A couple years back, I wrote an adaptation of the Puccini opera The Girl of the Golden West, which is set in a Sierra mining camp in the first years of the Gold Rush. As far as I know, mine is the first and only English version that has anything like the right kind of language, that has the characters singing in the authentic American dialect for that time and place. There’s a faro game going on during much of the first act, and I wanted to get the actions and the table talk right, so I did some research into the rules and language of faro. And me, a kid as little as a kitten, under the table sneakin’ chips for candy. Talk about married life! That was a little heaven. I guess everybody’s got some remembrance of their mother tucked away. I always see mine at the faro table with her foot snuggled up to Dad’s an’ the light of lovin’ in her eyes. Ah, she was a lady! They loved each other so much! Ah! As a secondary matter, I really hate the line in the Italian libretto about Mother’s pretty little feet. What on earth does the fact that her feet were small and pretty have to do with the point Minnie is trying to make with this anecdote? So I was hoping to find other, more worthwhile words to put on those notes. But for all the color of the lines in the novel, the matter was still puzzling. What was it that her mother was doing to help at the table, exactly? I felt I needed to know in order to get Minnie’s reminiscence right. With some reseach, I found the answer: An abacus-like device called a case keeper or case counter was used at the faro table to keep track of the cards that had been played. Usually the dealer “kept case” (kept track of the cards), but if the game was a busy one, the dealer might have an assistant, who was also called the case keeper, or sometimes the lookout. The lookout’s duties included keeping an eye out for sleepers, which were bets made that could no longer win because all four cards of the rank had already appeared; the dealer could claim those as his own if he — or his lookout — spotted them before the players who made those bets noticed them and took them back. Since the case keeper was on the table in full view of everyone, for a player to lose a sleeper wasn’t a matter of bad luck but of carelessless. As the game of faro is a fair one, with the odds giving no advantage to the dealer, spotting sleepers was the only way the dealer could make a profit from the game. I assume that a saloon would run a faro game primarily as a way of drawing in customers who would then buy drinks, and not so much as a way to make a profit from the game itself, but a lookout who was good at catching sleepers would have been an asset all the same. Square, though — that was Father! Mother sat as the dealer’s lookout. right up close to father’s. Lord, they was happy! They was so happy! It’s not much, only a line about “the dealer’s lookout”, but it’s right, right for Minnie’s character and right for the story, and even though I’d be lucky if one person in the audience had any idea what the dealer’s lookout did, the audience at least gets that her mother was there to help the dealer, not to play. So now that I had learned so much about a nearly forgotten card game, I’ve wanted ever since to see an authentic faro table and case keeper with my own eyes. I’ve seen pictures, of course. And I’ve seen a faro table now in the Oakland Museum, but there wasn’t a case keeper with it. Well, in the ghost town of Bodie, they’ve locked up the old buildings, but they’ve taken whatever furniture and other items were left behind when the town was abandoned, and they’ve arranged them in something like the layout they may have had, so that you can look in through the windows of the buildings and see them. 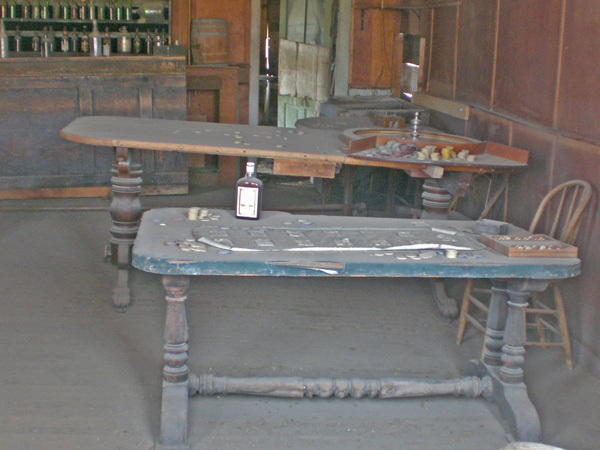 And Bodie has one surviving saloon building, and sure enough, in the saloon is an old warped faro table, and on the faro table is an honest-to-god case keeper. In my photo, the faro table is the nearer of the two tables (the one in back is a roulette table), and the case keeper is at the near right corner of the table. It has long been my strong suspicion that the romanticized ideal of America that so many conservatives want us to “return” to, comes not from an America that used to exist and has vanished, but from an America that never existed at all but seemed vividly real to these people when they were impressionable children, presented in popular entertainment like Leave It to Beaver, Ozzie and Harriet, The Donna Reed Show, and Disney movies of the Hayley Mills era.